One of the key attractions of Yellowstone National Park (beyond geysers, canyons, and wildlife) is the brilliantly colored thermal springs. You may have seen stunning images of bright turquoise, deep blue, and clear green rings in these steamy pools. Amid all the geothermal wonders of the park, Grand Prismatic Spring and surrounding springs are among the most wondrous and beautiful. 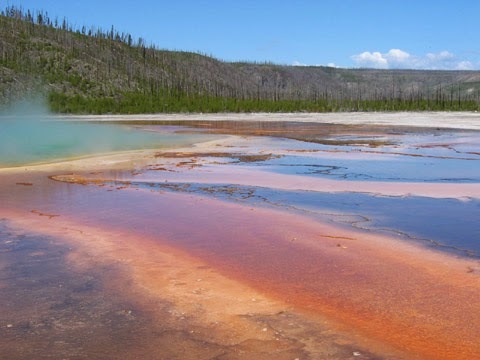 When fur trapper Osborne Russell wrote the earliest description of the park in 1839, he featured Grand Prismatic Spring, Yellowstone’s largest single hot spring and the world’s third largest hot spring. Reflections in the steamy hot springs at Yellowstone. Steam suspended in the air above the enormous spring reflects the colors of the rainbow. Scientists explain the brilliant hues as the result of a complicated interplay of underwater vents and spans of bacteria. 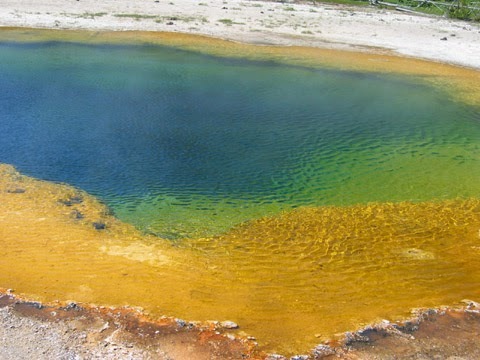 In the case of Morning Glory Pool, located at the end of a path by Old Faithful, scientists at Montana State University were able to simulate what the pool looked like between the 1880s (when temperatures were significantly higher and colors more vibrant) and 1940s when an accumulation of coins, trash, and rocks lowered the pool’s temperature, killed some of the bacteria mats, and shifted its appearance to orange-yellow-green hues. We didn't expect to see such incredibly beautiful colors in the springs. 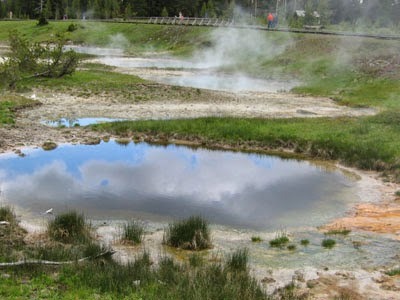 Yellowstone is home to over 10,000 hot springs and geysers and is the largest geyser field in the world. 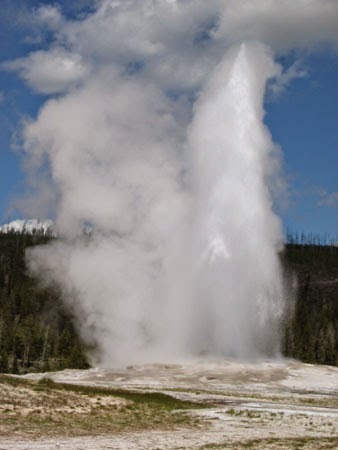 Some geysers erupt 300 times annually, while others, such as Steamboat Geyser, may not erupt for 50 years. One of the best places to see these steam vents is Upper Geyser Basin, located between Old Faithful (which erupts every 92 minutes) and Biscuit Basin Road. Within a span less than half a mile wide are countless geothermal features including more than 150 geysers and hot springs. Other notable areas to see when visiting Yellowstone National Park include Lower Geyser Basin, Fountain Paint Pots, Roaring Mountain, Artist’s Paint Pots, West Thumb Geyser Basin, Norris Geyser Basin (Yellowstone’s hottest basin at 459 degrees F), Mud Volcano near the center of the caldera, and Mammoth HotSprings where about two tons of travertine limestone (calcium carbonate) are deposited in terraces every day. Plan to spend several hours on boardwalks surrounding these steamy vents to appreciate this unique and amazing example of biologic interactions in nature. Don’t be deterred by a possible rotten egg odor which results when bacteria eat the sulfur and create sulfuric acid which then evaporates as smelly hydrogen sulfide gas. The colorful hot springs are a unique example of nature’s beauty you won’t want to miss.